It does not often happen in your life where you get the opportunity to teach your parents something new, well…. unless they ask you a real mundane question about technology. So when I got the opportunity to spend a weekend with my dad at Stonecutters Lodge I immediately made a plan! I previously visited this venue back in 2012 (Old article available here: Stonecutters Lodge Review) and with the knowledge of this previous visit I knew it would be a fantastic spot to introduce my dad to fly-fishing! What is even better about this venue is that he would have the opportunity to catch a fish in both a stillwater and a river, both not being super technical! 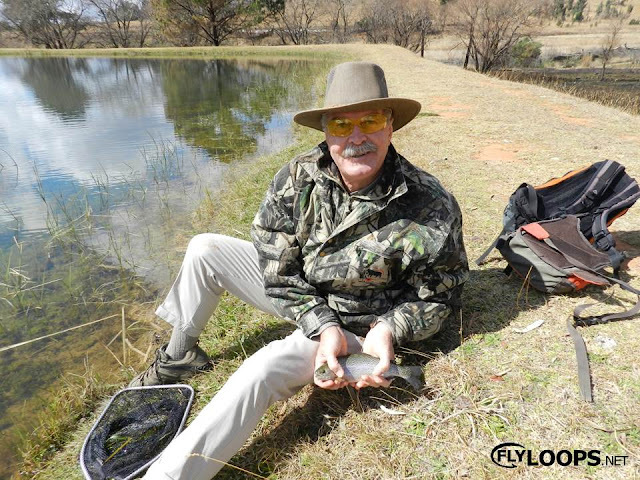 We left Johannesburg in the morning to arrive at Stonecutter Lodge (35km from Dullstroom on the Lydenburg Road) at lunch time, luckily we had some burgers packed and could have a quick lunch before heading out to the dam. To make the experience easy on my dad I decided not to go into detail with casting as the wind was howling on the day. I did the casting for him and would hand him the rod the retrieve, with his inexperience he missed a couple of fish and after an hour or so asked me to fish while he watched. It was not long before I landed the first fish of the trip on an epoxy buzzer. We decided to call it a day as it was getting quite cold and got a braai started before the evening set in! The next morning I decided to head out early before breakfast to figure out the fish before I would take my dad to the dam. During this hour session I was fishing a three fly rig with a sunburst blob, buzzer and small glass bead GRHE. After about 2 minutes I landed the first fish of the day, later in the session I landed another fish, both taking the small GRHE. I headed back to the Cobbles cottages for some breakfast. We headed out for the second morning session and I was determined to get my dad onto a fish, I fished both a sinking line (rigged with boobies and a tadpole) and a floating line with a blob, buzzer and dragonfly. We immediately had some fish on, however lost quite a few with my dad still figuring out how to fight them properly. Eventually a small rainbow grabbed one of the boobies and I managed to slip the net under him before he could shake the hook. After our success in the dam we decided to head to the river. 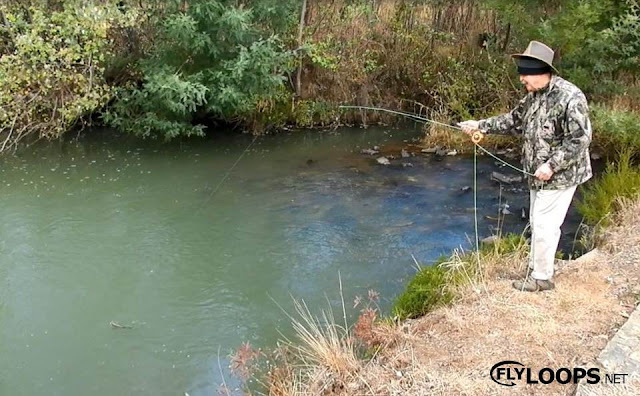 We stopped at various spots with little success, the river was fairly low and the fish would most likely be concentrated at certain spots. We reached a picnic spot with two umbrellas and a beautiful little run end in a pool. I realised that I left my bag behind, I quickly ran back to fetch it leaving my dad at the spot. When I returned to my amazement he had a fish on the line, now you have to realise at this point I did not show him how to cast properly yet or even mention anything like mending etc. 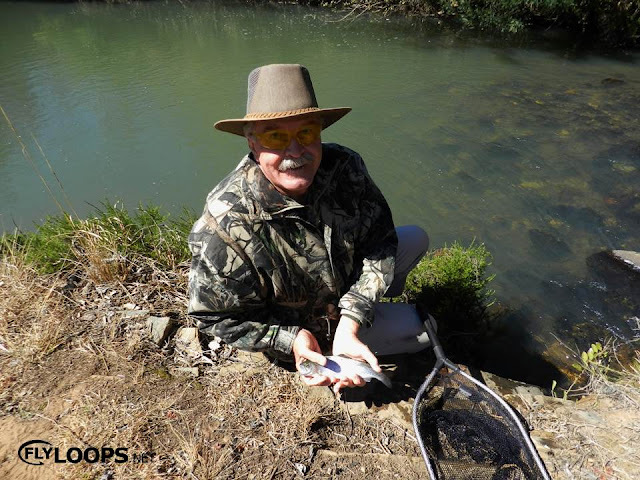 I quickly grabbed the net and camera to assist him and we quickly had the fish back into the river! After all the excitement my dad decided it was time for lunch and an afternoon nap, I however decided to head back to the river for the evening rise. 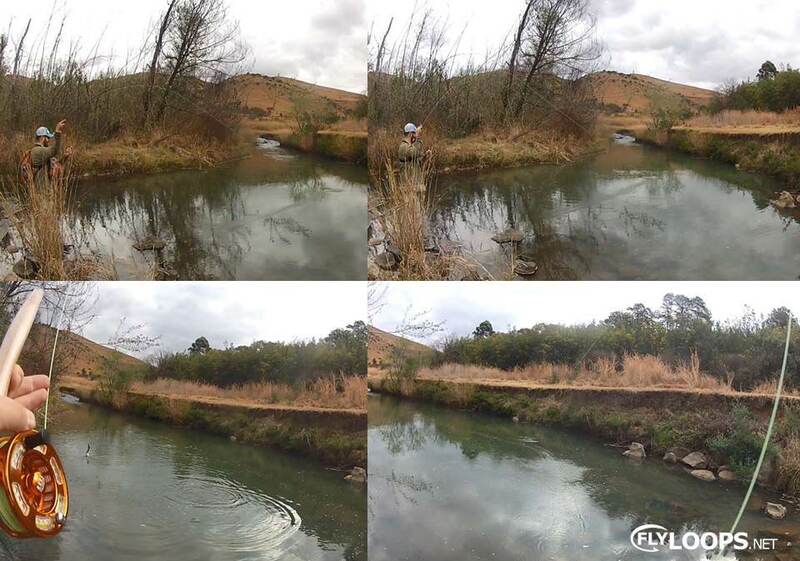 I quickly landed a few fish on nymphs in the same pool my dad had success in. As soon as the light started fading the fish started going crazy for a mayfly hatch in the glide above the pool. 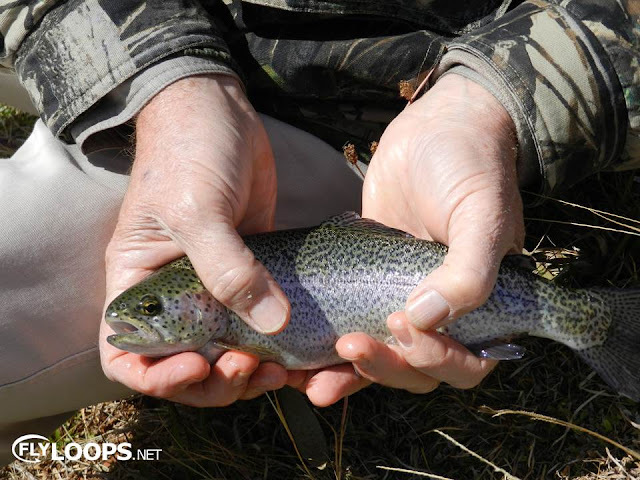 I had some serious fun with plenty little feisty Rainbow Trout coming out cast after cast! On the final morning I wanted to maximize my day, so I a got up at sparrow’s fart and this was indeed a really good decision. As I arrived at the dam the fish where rolling on the surface and I really got excited! I quickly tied on a dry and presented at the rising fish, it took me a few fly changes before a fish took a pale yellow klinkhamer! It gave quite a great fight with plenty acrobatic jumps before getting it safely in the net! 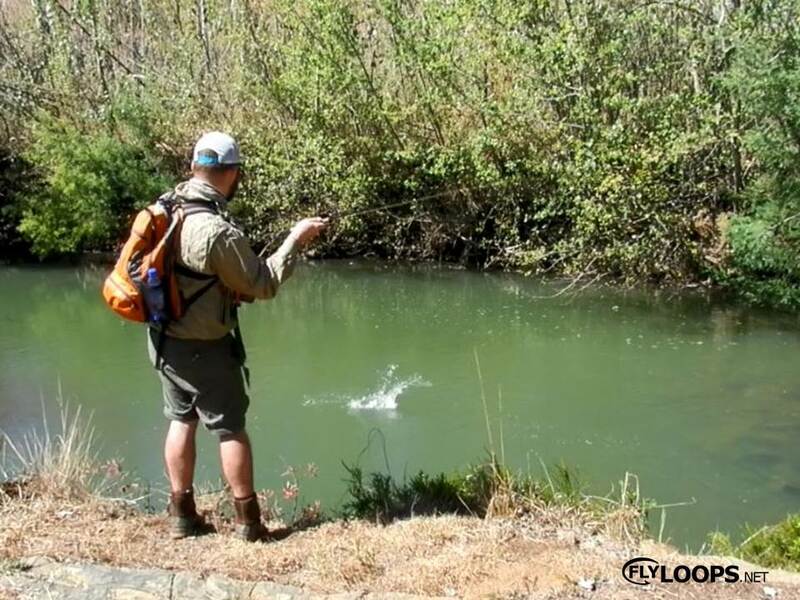 A nice tail jump from the Rainbow Trout on dry! An early morning Rainbow Trout caught on dry fly! Later the morning a switched tactics and managed land a fish on a buzzer rig. 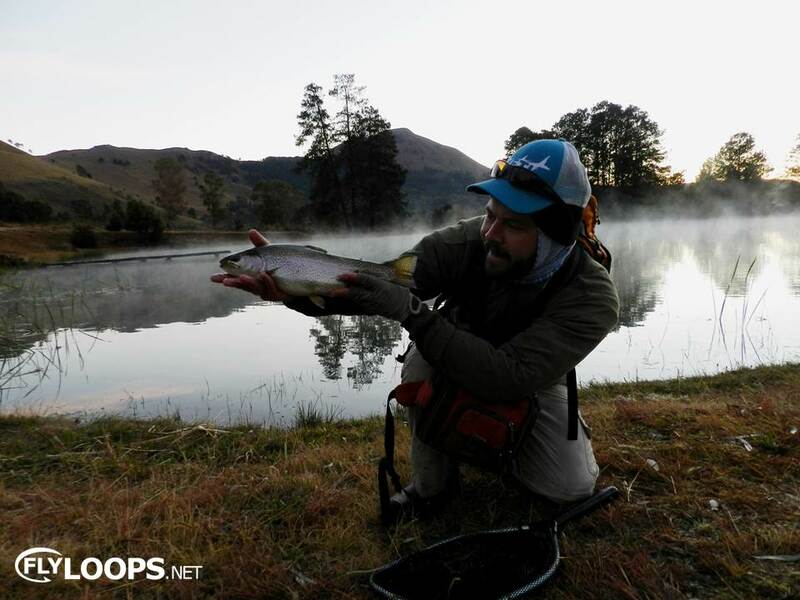 As it became lighter after sunrise the activity died down and decided to fish deeper with a sinking line and a three fly booby rig, it was not long before I landed the biggest fish of the trip on the opposite side of the dam, unfortunately I managed to let the fish flop out of my hands before the photos was taken. As a consolation prize the GoPro caught some spectacular jumps! 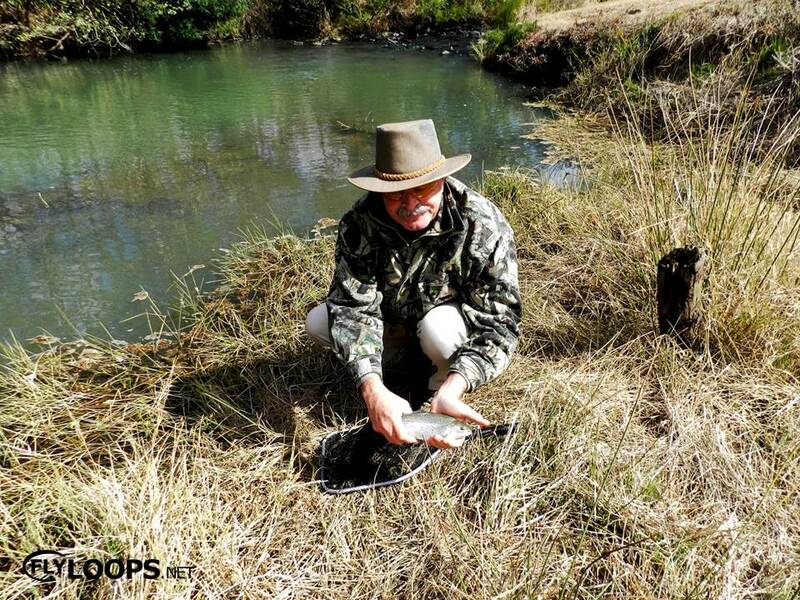 After this productive morning session I met up with my dad and decided to head to the picnic spot on the river to get him into some more fish! 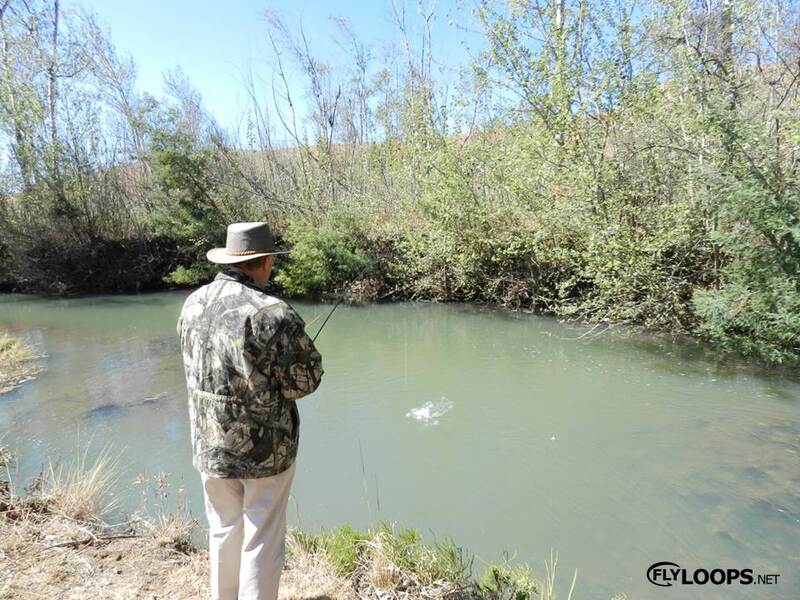 I barely had the camera setup and my dad was on already, seemed like he was made for river fishing! Perfect timing – another little Rainbow Trout for my dad! 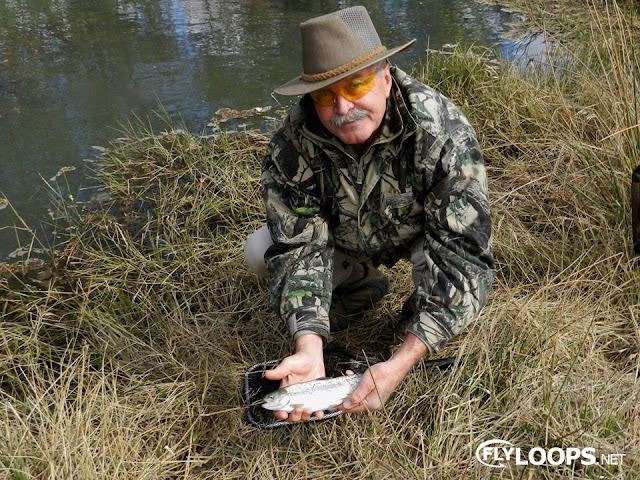 A couple, fellow guests from the lodge came past us and asked for some advice, I gave the husband a quick nymphing lesson on the the section above the pool and to his amazement hooked and landed a wild little rainbow. It was his wife’s turn and although she got plenty take she just could manage to set the hook one. After they left I landed a couple of fish before we decided to head back for lunch! My father joined me later on the river and I decided to call it a day and head back for an early braai and just relax. We decided to head out early in the morning on our way back to Johannesburg! It was a very enjoyable and memorable stay at Stonecutter Lodge, one I will never forget. For more information regarding the accommodation visit the their website (http://www.stonecutters.co.za/) and have a look at the gallery below for more photos of the accommodation, facilities, river and dams!